I got a few inquiries of fellow TT enthusiasts about the blue TT that was at Montreal’s importFest. (see my coverage here). Well, there you go guys! Enjoy! There’s a lot of pride when we complete a tuning project. In fact, the tuning scene exists for this. 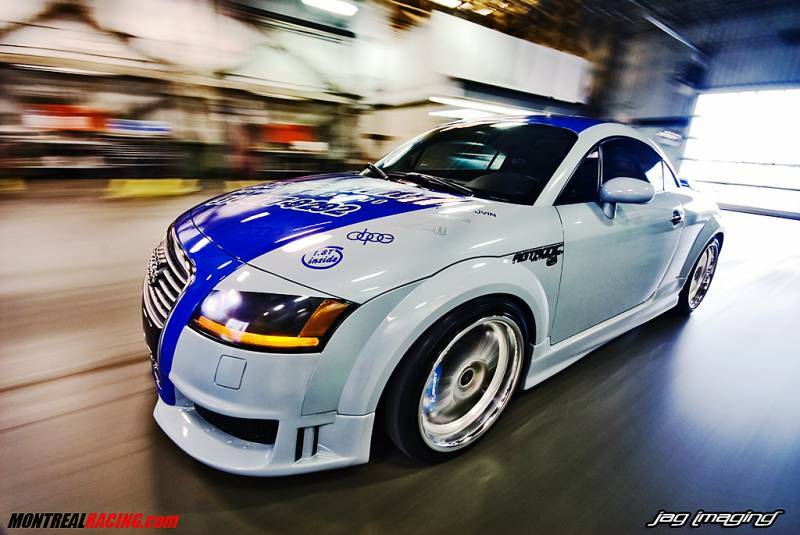 The owners of nice cars are proud to showcase the mods they are capable of doing to their rides and so is Dany Marquis, the owner of this Audi TT. He has modified nearly everything on this cars body since it has left the factory. This TT was built to win beauty contests, and she does not have much difficulty doing it! Aside from the aviator gray finish, one of the most beautiful original colors ever used by Audi, it is difficult not to notice the blue marbled finish in the center of the body that extends to the front grill of this A8 . Hard to imagine the finish was red at first! We also note that the TT is lowered thanks to a Reiger body kit & bumper. While sitting on a VMax adjustable suspension, the car is perched on DAI 18 inch rims that are 8.5 inches wide. Recently, our owner swapped these wheels for a set of Fast Wheels. Finally, Dany just installed huge K-Sport front disc brakes. Since this is a show car, Dany has continued with the same theme for the interior. Among the items worthy of mention, there are G-Force seats, a Realco short throw gear box and a five-point JS R harness button to suggest a “race car” look. The blue marble is also present in the interior of Dany’s TT as well. We can quickly see that the audio / video equipment inside the car has nothing to do with your small radio bought in stores. Dany has the complete package: A Clarion DVD player, 2 7 inch monitors, XM satellite radio, two amplifiers and four MA Audio subwoofers all custom cased in the trunk by hand. This German car has a list of mods under the hood so long it is best to consult the Team Refugee website, a group of car owners for these exhibition cars. But we can still tell you that the four-cylinder 1.8-liter engine is as energetic as possible and that the sound it emits is typical of Audi products. Despite all the equipment onboard, which makes the car considerably heavy, Dany still manages to do the quarter mile in 12.56 seconds at Napierville, all made possible with a turbo pressure adjusted to 35 pounds. Dany was present at the Salon de Saint-Hyacinthe and he will also be present at several other rallies this season where Dany will be pleased to introduce his German beauty, that’s for sure! This entry was posted in Audi TT MK1, Paint. Bookmark the permalink.